So, I was going to post yesterday. However, yesterday my dad woke me up telling me we (my family and I) are going to Vegas. Uh, what? That was a spontaneous trip, indeed. I also played my first real game of monopoly and it lasted for SEVEN hours non-stop. And, I still lost. Seven. Hours. That`s more than the average number of sleep I get per night during the school year. I`m not one to make New Year's resolutions, since I feel like we can make those anytime in the year...Haha~ If a new healthy lifestyle or diet is on your resolution list, I`m sorry these cookies aren`t healthy for you. BUT, I can say, they are mighty good...and you just MIGHT have to make them. Oreos are awesome. 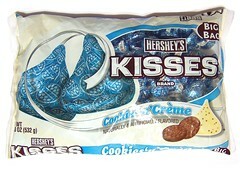 I love those Hershey's Cookies and Creme bars, so when I found these kisses, I freaked out. I grabbed a bag and came home happy. Then, I made these super cute cookies. An awesome way to start of 2013? I totally think so. ;) You have the option, which I highly recommend, to roll the cookie dough into some Oreo crumbs before baking (like the photo above). And I`m curious, do YOU make New Years resolutions? Let`s make 2013 a good year! 2. Line baking sheet with parchment paper or silicone baking mat. 3. In a bowl, with an electric mixer, beat together butter, shortening, and sugar. 4. Add in egg and vanilla extract, combine. 5. In another large bowl, whisk flour, baking powder, salt, and 1/4 cup of crushed Oreos. 6. Add the dry ingredients (flour mixture) into the wet ingredients (butter mixture) and beat until combined. 7. Roll dough into 1 inch balls. 8. *Optional: Place the rest of the crushed cookies on a plate and roll ball into finely crushed Oreos. 9. 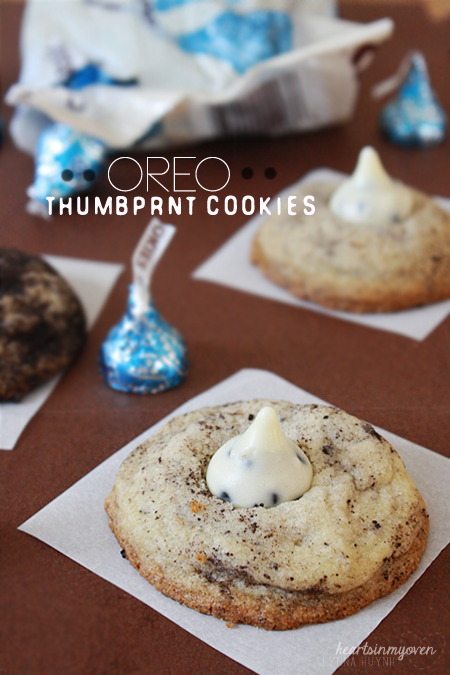 Place on baking sheet with a two inch space in between each cookie. 10. 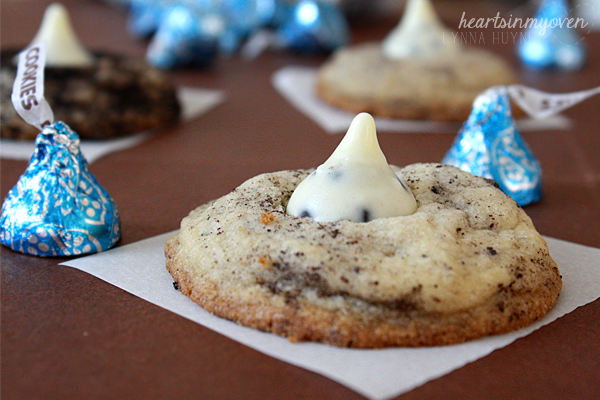 Bake for 9-11 minutes, or until cookies are slightly golden around the edges. 11. Cool on a cooling rack slightly (about 1 minute). 12. 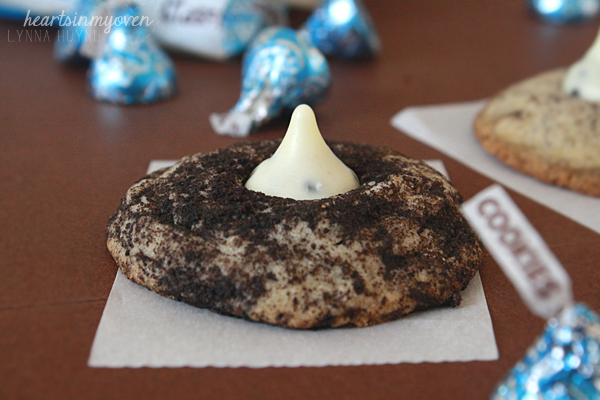 Press unwrapped Cookies and Cream Kiss on top of each cookie.